Safinah Group is very proud to have contributed in a small way to this publication. Iron is everywhere around us and within us. It is vital to organisms – it colours our blood as well as the earth. We admire people with an iron constitution and a steely determination, and almost everything we do involves iron and steel in some form. Yet we hardly seem to realise how reliant on this ancient metal we are. Without iron there would be no cars, no cargo ships, no railways. Most bridges and buildings would crumble. Agriculture would have stayed small and we would have had no Industrial Revolution. There would be no energy networks, no elevators, no oyster-shucking, no piano music… And paints would not have become what they are today. 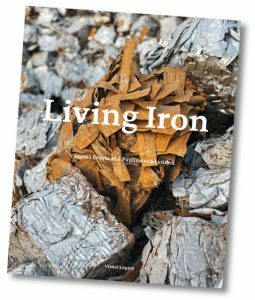 This book describes the fascinating life of iron and our life with iron and steel, from the earliest days of our planet to our growing ironworking techniques and the miracles that are achieved through metallurgy today. It delves into an exceptional combination of qualities no other material offers us and shows us why, through millenia of rust, recycling and reinvention, this tough stuff continues to reveal enormous potential for our world and our future. VANESSA EVERTS is a writer, editor, producer and director. She has worked with her mother Pauline van Lynden since the publication of Rajasthan. Her book Sophie Steengracht in Peru was published by Waanders Uitgevers in 2018. Having started her professional life as an actress, she likes to wear many hats. PAULINE VAN LYNDEN’s Rajasthan was an international bestseller in four languages and one of the London Sunday Times’ Top 5 Illustrated Books. Her second book, A Resistible Force, won the Zeeuwse Boekenprijs. She studied political sciences, was for many years an art bookbinder and is a firm believer in finding treasure on your doorstep.